Bacon ranch pasta salad. Americans are unique in that they put ranch dressing on just about everything, isn't that true? I suspect folks in Greece or Switzerland aren't dousing their foods with it, but I could be wrong. I had some friends in college who lived for ranch dressing--we all agreed that they should really just order a large bowl of ranch dressing with a side of fries or chicken or whatever else could feasibly (or unfeasibly, if we're being honest) be dipped into it. It's not like our cafeteria food was bad and needed to be masked with the dressing; they just really loved the flavor. That seems to be true for many folks, so a pasta salad moistened with a bit of ranch dressing and smattered* with bits of bacon and veggies is sure to be a hit at any type of potluck or picnic. It's easy to tweak--feel free to add much more bacon or olives or tomatoes or cubes of ham or cucumber, and definitely adjust the consistency to your liking with extra milk. If it isn't ranch-y enough for you, add more mix! (I have a feeling my friends would add quite a bit more.) I do love an adaptable dish. Bring a large pot of salted water to a boil and cook the pasta according to the package directions. Drain the pasta and rinse with cold water. While the pasta is cooking, in a large bowl, mix mayonnaise, sour cream or Greek yogurt, milk, ranch dressing mix, garlic powder, and a pinch of salt and pepper. Add the cooked pasta, chopped pepper, peas, bacon, and cheese and gently mix to coat with the dressing. Add more milk as needed to reach the desired consistency (you may have to add even more after the salad is thoroughly chilled). Add salt and pepper to taste, then cover and chill at least 1 hour in the refrigerator. Looks like a crowd pleaser! Looks so good !! how is your lovely baby :) she is asorable ! I also love an adaptable dish! We are not huge ranch consumers at my house, but the friends of my daughters certainly are. We stock bottles of ranch for pizza parties. I will make this the next time we host a 'hang-out' (which is much more cool than a play date). The perfect picnic salad for sure! As a pasta lover, I have to try your recipe, Grace! Excellent job! I love ranch dressing, although over here in the UK it's not really that popular but it is easy enough to come by. I think I got a taste for it when I visited America years ago. People in Switzerland don't know what they're missing if they aren't dipping everything in ranch :). This is my ideal pasta salad! This looks like the right way to flavor pasta salad, to be sure! And who doesn't love those cute little shell noodles? They would be great for holding the dressing. This looks wonderful and is my kind of pasta salad. I've only just started eating Ranch dressing and really like it. Thanks! This looks like a crowd pleasing salad --- like you say, we certainly like our Ranch dressing! Well a whole country can't be wrong but I have never tasted it and we can't get ranch seasoning so I will have to have it when I visit!! 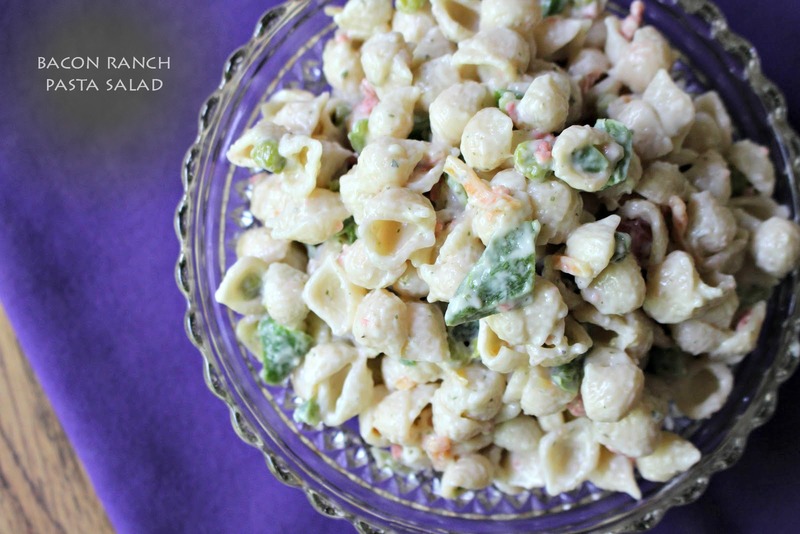 My ranch-loving husband will enjoy this pasta salad! This is great dish for these hot August days and it looks really tasty too, Grace!